This week was one of those “let’s see what’s in my kitchen and throw something together” kind of weeks. Luckily I had lots of scraps around and only had to run out for toppings, which made for a colourful, gluten-free, vegan and healthy chili. 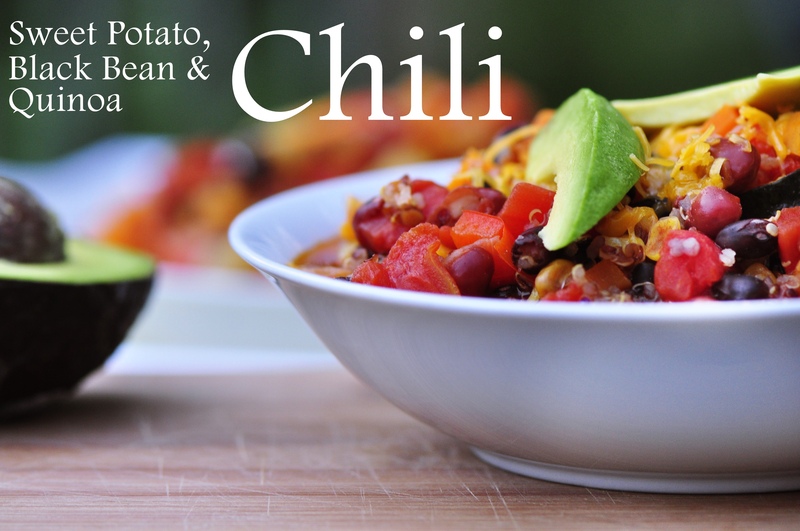 I feel like a lot of people see chili as a “cold weather” kind of food, but as a vegetarian it’s got tons of vitamins and nutrients that might be difficult to fit into other meals, and you can serve it cold depending on your preference. I ate some at dinner with cheese and avocado on top; then the next day I took it for lunch and ate it as-is. Quinoa in chili is something new I tried because it gives that extra boost of protein without using soy. Although soy is a really versatile and good-tasting product, I’ve heard a lot of things about the negative effects that can come from eating too much of it. So I try to limit my soy intake and use other sources of protein. In this case, two kinds of beans and quinoa do the trick. I saw the idea for using quinoa in chili from Two Peas and Their Pod, then I just adapted the recipe from there. Place quinoa and water in a small pot, cover and bring to a boil. Once boiling, reduce to low heat and simmer for 15 minutes, uncovered. The water should be completely absorbed at this point. Set aside. Heat olive oil in a large pot on medium-high heat, then add onion and garlic. Cook for 4-5 minutes, then add sweet potato, zucchini, bell pepper, carrots and celery. Cook for another 5 minutes once onions are just lightly golden, then add in both kinds of beans, canned tomatoes and broth. Then add cayenne pepper, cumin, chili powder, salt and pepper. Bring to a boil, stirring occasionally, and then lower heat down to a simmer. Cook, simmering, for 25 minutes—partially covered. Add in corn, then cook (still on a low simmer) for another 10 minutes. Once finished, the sweet potato should be easily piercable with a fork. Serve hot with melted cheese on top, fresh chives and avocado slices. I never thought of adding quinoa into chili, but the next time I make it I’ll be sure to try it- I bet the texture of it in chili is awesome, too! Looks beautiful, delicious and healthy! What a lovely sounding and looking dish – it’s so vibrant and looks totally scrummy 😀 A great idea for using quinoa, of which I have a bag in the cupboard gathering dust. Thanks! Beautiful dish! 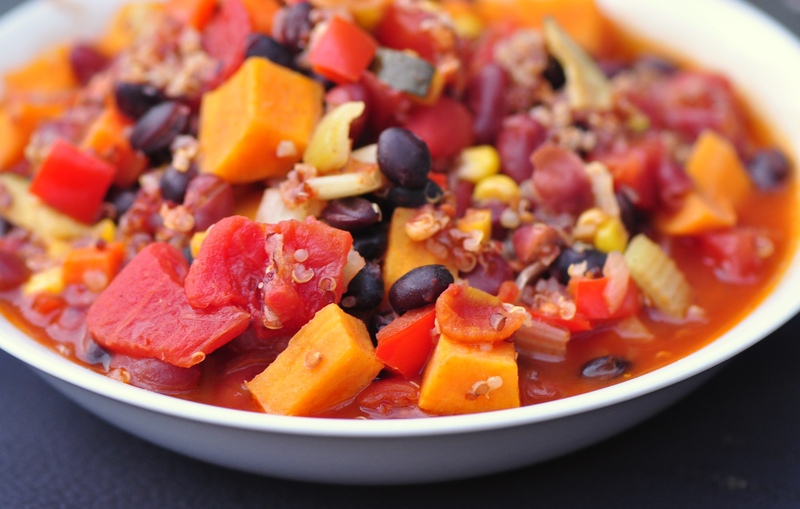 Love the idea of sweet potato in a chili dish. YUM! Sweet potato seems to be good with everything 😛 thanks! 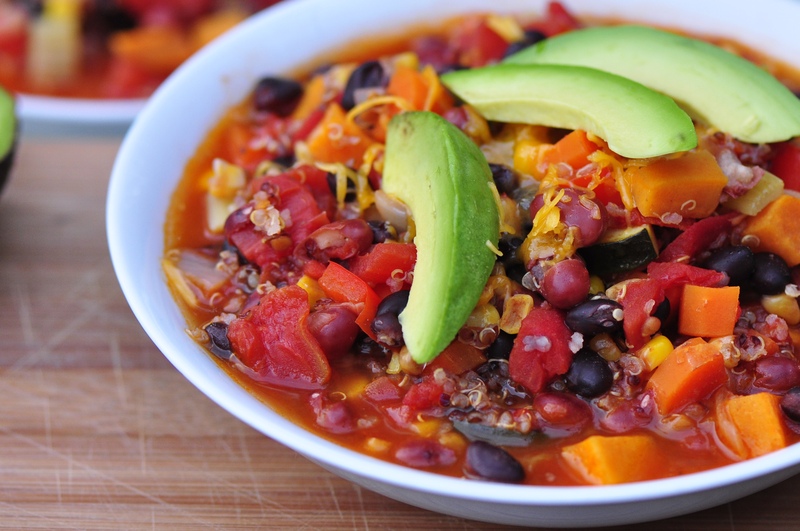 Your chili would be perfect for this hot summer nights. I absolutely love the vibrant colour of this dish! !